if I would be interested in being the Guest Featured Artist for the Tag You're It Challenge. Some of you might remember that I was a member of the TYI Design Team a couple of years ago. As this challenge holds a special place in my heart, I immediately accepted Carol's invitation. And I'm extra glad I did, because it turns out that Tag You're It #79 will be their last challenge. So I hope you'll play along while you still have the chance. so I decided to make a tag to coordinate with these lovely colours. it into my versamark pad, so I could emboss them in gold. I adhered it to a tag I created using PTI aqua mist cardstock and Tag Sale #5.
embossed it in white on a strip of black cardstock. based on my tag, and to play along, if you'd like. We have lots of snow !!! Leigh, I'm so honoured you accepted my guest invitation and oh my! Your fusion of your inspiration wrapping papers has resulted in a gorgeous tag! Love the light blue background and the stunning snowflakes sporting whispers of gold! Thank you so much, my friend, for being our Featured Artist for this finale challenge! Thanks for your beautiful inspiration, Leigh! I love the colors and embossing. I was really excited to CASE it! This is so pretty!! I LOVE that tag you created with the touch of gold. So sad to see this challenge blog go by the wayside. So fun to make the tags!! 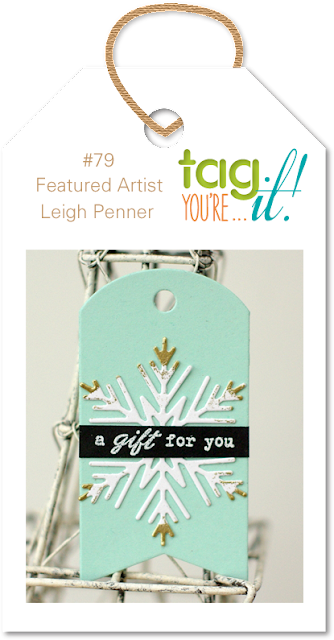 Thanks for being our last Featured Artist, Leigh. The soft blue makes a lovely tag and I love the gold dipped snowflakes. Simply wonderful tag Leigh! Love the gold embossed tips of the snowflake! Thanks for the inspiration! The gold dipped tips of your snowflake are so elegant! This is fabulous Leigh! Oh, so elegant, Leigh! I love the smidge of gold on the snowflake's tips! Hoping I can play along for the last TYI challenge! Beautiful tag Leigh. I love the gold at the tips!